This is one of my fire quilts which I had left stored at my aunts house- somehow I have never felt it was quite finished even though I had put the binding on and sleeve- but finally I fellt I knew what else it needed- hand stitching around the tie dye fire spots. I am already liking the difference the stitching is making- even though it is not so readily apparent from these photos- more later. I have obviously been thinking of new directions, new life and making do with less things, less things with which to make my work- my working equipment is reduced to two shoe boxes- one for my threads and scissors etc and one for dye/ printing equipment- and one journal only! Obviously things need to be reasonably simple- not a bad thing as I am a believer in less is more and I find that many things are overwrought with glitter,beads, thread, sequins and all manner of surface attached things including sometimes too much paint. So..... i would like to throw out a challenge- is anyone out there willing to follow the KISS principle? ( KISS- Keep it Simple Stupid)- make a 50 cm square quilt using only two coloured fabrics ( or white for that matter) and threads ( as many colours as you would like) but using only straight stitch by hand or machine- no fancy stitches- of course straight stitching can be done in any form- and absolutely no embellishing- just fabric and stitch and your imagination! The snow is melting- it was almost a white Christmas. It looked lovely whilst it lasted and sure beats worrying about bushfires and high fire risk days. Coming away for a length of time has mean that I have had to leave behind many of the things which I normally work with including lino-cuts. I have bought more lino so I have been making new linocuts and this owl is one of the new linocuts. I have to think of some more designs and inspirations. And of course I will be teaching an on-line linocutting course in January next year. the price for the on-line course is 40 euros- I raised the price a little after many of the students provided feedback to say they felt I should charge a little more for the class as the content was good and wide ranging. When i was in Paris I bought a book on the Werksstate- the Austrian version of art nouveau- I like how they designed so many aspects of their surroundings ( much as the Rennie-Macintoshes did in Scotland) and how they repeated motifs in different objects.I think it is something I would like to develop an enduring motif. I use pomegrantes a lot as a motif and love it and have used it since the middle nineties as a thread in my work, for which the classical and traditional symbolism associated with the pomegranate add meaning to the work itself- but i feel i want to develop another leit-motif in my work. I have also used fire as a motif. But a new dream needs a new motif- that is my motto for 2010! I hope to post another blog post before Christmas- but in case I don't I hope however you celebrate it or not that you have a wonderful day ! We decided to leave France yesterday, for the Netherlands where we are spending Christmas before going to le Triadou in France. The forecasts for snow and verglas sounded quite scarey and proved right as it has snowed most of today. We are staying in the small city of Hulst in Zeeuws Vlaanderen.It looks delightful covered in snow. I am excited by the fact that after 44 years of hot Christmases in Australia, finally when I am back in the country of my birth for a Christmas it will be a white Christmas! I am looking forward to the oliebollen! I have also been re-united with some of the things and quilts I had left behind in Europe last year- I had forgotten quite how much stuff I had left here! At least I will have some fabric to play with again and try the new linocuts I have made out. I cut them a couple of weeks ago especially for a class I was teaching near Paris, Marcoussis ( where I will be teaching again in March). I will also be starting another lino-cutting course over the internet sometime in January- if you are interested please email me. I am also working on developing the material into a pdf book if anyone is interested. I could not say goodbye to Venezia and not show you a picture of masks- they are everywhere, many of them made in places other than Venice- yet they, and the glass are amongst the main tourist objects for sale. One thing you notice when you travel how much the same everything is everywhere- it is really difficult to point to any objects of difference in different places- it seems culture has become commodified into the well known brands- and every city boasts brands form the highflying high profile ones to the more mundane ones for the budget conscious. Venice has masks and glass and many of the store keepers are anxious to point out that their objects are authenttic and not produced in china like similar objects in other stores. Even the graffiti on the old house entry from a canal boasts a universality which suggests hiphop rather than Casanova, Byron and any other number of latin lovers who dashed around the canals of venezia in search of romance and secret encounters. Such was Venice- yes it was still lovely and cold. And then we came back to a white Paris- it is blanketed in snow with more forecast. Yes I did see pomegranates too, with chestnuts, fresh walnuts and sundried tomatoes! And yes it's also true I am a complete fool for printed things and blank books/journals. I always think I shall write in the journals and then somehow find it too daunting. Bought a delightful journal book from Scriba- blank pages interspered with 14 wonderful reproductions of the work of Rosario Morra whom Scriba represents in Venezia. Morra's etchings are marvellous- how will I ever write on the blank pages?? ?Wish I had discovered this little gallery on day one- I would have happily gone without lunches etc for one of his small etchings! And last but not least- one of those delightful scenes you encounter in walking around Venezia! The Opera last night was lovely- even if it was freezing to get there- we had to walk very briskly to beat the cold.It was delightful being so close to the stage ( the opera house is not very big) to be able to see the faces of the singers properly and to enjoy the singing music and acoustics. The images are of a persimmon tree with a church spire in the backgrouds- called kaki locally I love the way the orange fruit stays on the tree even after all the leaves have dropped, and a wonderfully ornate light on a street corner! I am back!! Phew it's been a challenge trying to load photos as we managed to not pack the chords to connect the camera to the computer in the panic to get the house packed.I promise I will report in more often from now on as we have solved the camera problem. From the photo you can probably guess we are in Venice, glorious sunny but very cold day today and then we decided to get tickets for the opera- so more braving the cold, but the chance to see la Traviata in Venice proved to be too tempting. Hopefully I will be reporting more textiley things in the next few days! Cioa! I had hopes of sorting through my hand dyed fabrics and putting them into 1 kg lots of mixed colours and selling them ( 1 kg of fabric is about 3.5 metres of fabric ) for $25 plus postage- but is it worth the effort and trouble as panic has set in?? ?If you are interested let me know please I think i can manage to make up some packs on request! I have to go and get rid of the last bits of rubbish as they take away the skip- I have been ruthless with clothes- not a scerrick left of anything I am not going to take with me- what's the point of holding onto bits and pieces that will never fit again . I know memories memories, but I am determined to look forward and not back. I tied and dyed another piece of silk- this time bigger- the full width of the silk and 150 cm long- I really like this piece and had been thinking of machine quilting it- but I think it's screaming hand stitch hand stitch. Whilst I liked the piece I showed in the blog post before last, this one says more about dwindling waterways and the heat and drought that is the cause for the dwindling waterway- and the colours are very suggestive of the Australian outback. If anyone would like to buy a piece of silk done in a similar manner and of this size, the price is $200 US- and obviously I don't have much time left to make one. It takes ages to tie the rocks into the fabric and then to undo it all- and yet to use rocks seems somehow right for these pieces. And for those of you who have asked whether I will continue to blog when I am in France- the answer is a most emphatic Yes!! Blogging has become a way fo life for me and has become a part of my creative process- I love the feedback I get and it takes away some of the isolation you feel at times. I am hoping that once I have my Southern Lands quilts done, I will explore my french experience- I am not sure how yet ,but in the back of my mind I am thinking about old textiles( with modern interpretations) and traditions maybe some woad??? I am trying to be organised in my packing so that things will be easy to find, and also to rationalise things a bit. Over the years I have gotten rayon threads for my hand stitching from England- they are used for weaving, and as I am ordering blind I have found I have ended up with quite a lot of double even triple colours , or ones that are very close in colour. I am taking some of the threads with me so I continue muy Travellers Blanket and finish it and also hand stitch several Southern Lands pieces, but I also had a lot of thread left over. Some textiles I found today in a sort of tidy up- iridescent pink orange and turquoise sari organza and indigo dyed sateen cloth from I think it was Mali- all to be put away fro awhile- such a pity! Aren't they beautiful. We are int he final final count down- still not much packing done but we will get there I hope. I am teaching near Paris on December 3-4 ( printing and painting fabric day one and inspiration infabrication on day 2) and again on 11 December - free machine quilting at Best of Quilting. If you are interested please follow the links on the website as class space is limited. I also have a friend at St Pierre d'Albigny who has set up an internet business selling procion dyes and trasnsfer dyes in France as well as other surface design needs at Teinture Textile. This sort of product is hard to buy in france so it's great to know that these supplies can now be purcahsed in France. She will be dooing tradeshows int he coming year as well so keep your eye out ofr a Kiwi in France! The other day I had to kill some time whilst waiting for my eldest daughter to finish her exams- it wasn't worth going home and I forgot to take my travellers blanket to stitch. So how do you kill 2.5 hours of time- I leafed through various magzines in the newsagents and had a look at New Zealand Quilter which always has a good selection of different quilts articles. Imagine my surprise as I flipped through, to find my Climate Chane quilt taking up a whole half page lenghtwise- you can even read the writing! 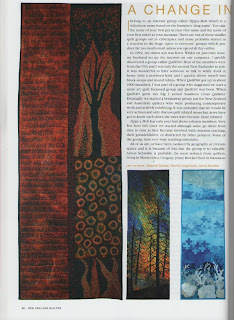 The two other quilts on the page are left to right; Gloria Loughman and Jenny Bowker. More images of the exhibition can be seen here, as well as statements and resumes for each of the quilters involved. And then finally the sun has come out- and it's almost instantaneously summer- very welcome after all the rain! I think when I moved to this house at about this time last year i wasn't actually expecting to be moving in less than a months time ( 26 November we fly to France)and that I would be throwing my hat into the wind and setting off for France. So on the upside it is a dream coming true- to test my toes in the sands of France- so there is much to look forward to , but there has also been much to say goodbye and farewell to- things that were dreams of the past. I don't think I will ever again live in Gellibrand or its surrounds. The bush and the Otways are beautiful, but it is not my place anymore; it's seen the shattering of family, the end of a marriage, and the fear of bushfires.It has been incredibly hard on my children- a harshness from which I had wished to protect them but which I ultimately couldn't and so it's time to move on. It has also been a time of loneliness- there were days where I felt I could not face the world, where I could not work, where I couldn't even find a grain of inpsiration and the rain never seemed to stop- but as with all things ,those things pass too. 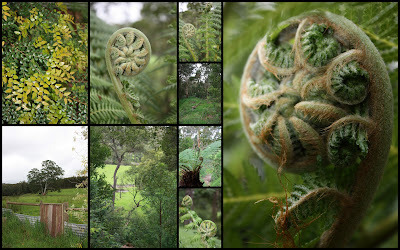 However I don't think I will ever lose my love for unfurling fern fronds- there is something very primal about them- you both want to cup and hold them and yet the curiousity to see the unfurling fronds delivers constant surprises. So last weekend was the last time I gave a workshop in Australia for quite some time- I haven't set myself time lines- those will emerge as we settle into a new life. Now the question becomes what will i take?? Is anyone out there flying to Europe from Melbourne in late in November or early December who could help carry the My Place quilts to Europe? I was rather horrified at the cost of shipping them and as they weigh 20 kgs which is all my luggage allowance - and I do need some clothes and things to work with! And anyone wishing to purchase my 72 Ways not to Stipple or Meander or 72 MORE Ways not to Stipple or Meander I suggsest you do so soon- as I am not sure when I shall have them available again - not until at least February next 2010. I have been trying to sew small pieces for sale for the weekend. The first image is a pomegranate applique- I did this for the chapter page in my caravanserai book. I had only cut it out ut decided it would make a nice piece on its own with a counter balance border that I had made out of the same fabric and painted at another time. It measures 12 inches by 11 inches ( 30 cm x 27cm) and is for sale for $125.00US inclusive of postage. The second image is another pomegranate variation- 8 inches square iand is also for sale for $50 US inclusive of postage. I have been trying to clean up around the house- there are many deciduous trees and so many leaves to rake up, it was tooo wet to do it before- I have to burn them all before Novemeber the 1st as the burning off season ends on Saturday- hard to believe the fire season is already upon us when we have had so much rain. We have also been cleaning up the block of land- getting it mown- the grass has leaped- unfortunately no one seems to be in the mood to buy it- it would be so nice to seel it before we go away. How Fast Can Grass Grow??? It seems like i only mowed the lawn the other day and now it has to be mown again! I am trying to do some sewing, but the car debacle has left me a bit blegh! I intend to do lots of small pieces in this next week as well as getting the fabric ready for my next waterways piece. I am tempted to make a big linocut also reflecting waterways so I can make a number of different prints , using different fibres. As Laura mentioned in the comments of last post- I am teaching a masterclass in Belgium in Essen on 13- 15 April 2010. You can see details on her website, but we will be dyeing fabric, printing and painting on day 2 in order to make original one off pieces ont he last day. There are not many spots so if you are interested let Laura know via the website link I have given- just click on workshops. I am also teaching in Switzerland 16-19 June 2010 at Leysin- for residential workshops. If you are interested just follow th ewebsite link I have given.. If anyone else in Europe is interested in workshops please contact me . I have updated my workshop list ( i have actually included images and one or two new classes- why didn't I do this before???) We will also be doing residential workshops at Le Triadou- near Montpellier- these will take the form of masterclasses where you will spend a week developing work- class numbers will be small ( no more than 8) so it will be intensive and it will be a great opportunity to explore your creative process and vision!. Then I was booking airfares- I was getting one quote of fares from Singapore Airlines website ( and bear in mind that when we fly from Australia it is much dearer than for Europeans to fly here)- but the site wouldn't accept my card- and I had to contact my bank, did all that, re booked and still payment wouldn't be accepted. I re did it several times- over a two and a half hour period- each time the fare quote was the same but in the end I had to go through a travel agent ( whom I usually use) and they had been quoting the same fare early morning, but after I had wasted several hours trying to go in through my Frequent flyer program, the fares had gone up by $200- so I wasn't happy. Singapore Airlines said because their quoted fares go fast- but that doesn't excuse about 2.5 hours of trying and getting the same fare quote each time. I bet their response would have been different if I was flying Business class- sometimes it's frustrating how powerless you are when you always fly economy class- it's like you are a meaningless number! And despite having had sufficient points on various occasions I have never yet managed to get an upgrade either. Anyway i did dye the silk piece above- thinking about river red as part of my waterways system- I am still thinking about it- the lighter colour is not quite as orange as I wanted it- I can repaint it, but I will need a nice sunny day for that- and none of this timewasting runnign around for bad news! I am slowly getting my head around the idea that I have to pack up everything and that there is a mountain of stuff to do- three more pieces to make for my waterways series for Southern Lands( I did dye the silk yesterday but I am still thinking about it- whether I like it enough or whether I do it again)- and what to do for the smaller complementary pieces. I also have to make a coloured 72 MORE Ways piece for my book which will be published in french.I also have to make a lot more small pieces. I am trying to track down a machine hwne I am in Europe but at the moment I will not have a machine. Anyway in some of the desultory packing I have been doing a found a half finished pomegranate lino-cut and decided to finish it. It is for sale ( as I already have a number of lino cuts of pomegranates :-) ) for $60US inclusive of postage. It measures 6 inches square, is hand carved, and the resulting print is on the red fabric. If you look after it carefully you will be able to use it again and again. I simply wash them in water with a small scrubbing brush . I spent the weekend at Craft Expo- minding the My Place exhibition which was much admired. I also caught up with a number of people from Finley High School- for years I never see s soul from this school and then suddenly on one weekend I run into three different people who all hail form the Riverina. MY PLACE- Last Chance to see it!! There is only one more opportunity to see this exhibition in Australia when it will be shown at COPACC in Colac ( which is my local biggish town) on 31st October and 1 November. Entry is a gold coin donation. There will also be a champagne Opening on Friday 30 October at 6 pm and I will give a floor talk as well. 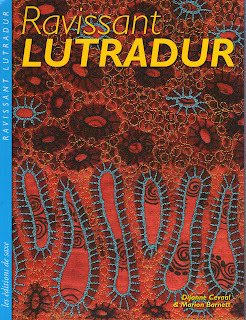 There are still a few place left in my master class I am teaching on Saturday and Sunday- we will be transfer painting and printing on lutradur and will sttich the pieces thus created. This will be the last workshop I do in Australia for quite some time- at least until 2011 and possibly until 2012 ( unless someone pays my airfare back to Australia :-) ) I will also have some of my own work there- for exhibit and sale. I did quite a lot of handstitching on my small waterholes piece- it's just about finished- as you can see from the photo a lot of stitching has gone into it and I really wonder whether it is worth it ? Unfortunately I have had to raise the prices for my books for British pounds/UK buyers- our dollar is riding ridiculously high- and i realised with some alarm that with the postage costs also increased and printing costs I am barely breaking even in the sterling currency- sorry about this . On another note- it looks as if the Syria Tour and the Arts& Craft Tour of England Belgium and France that I am doing with Creative Arts Safaris will go ahead. so if you are at all interested please contact Creative Arts Safaris and book a place we are going to have a lot of fun and hopefully will inspire you! I have been dying fabric these last days and did some forest pieces. I have done very little dyeing since moving to a rented house as I am petrified of getting dye on the white grouting in the laundry and well the whole set up to dye is a bit convoluted- so it is not as easy as it used to be. And then there is the issue of moving to Europe at the end of Novemeber- I don't want to have to store too much dyed fabric- so I don't carry the stock I used to ( all of which imapcts on a small business like mine) Anyway I don't think I shall be dying too much forest fabric in the next few years so here is your chance to get some. Then I have to come back and do soem serious work on my waterways work for Southern Lands and pack up a house and life! My goodness October crept up without warning. here was i thinking I had plenty of time to write two articles but they are due this coming Friday. Then I will be installing and minding My Place at Craft Expo which starts later this week in Melbourne - and all of a sudden the week is totally chock a block full. I also have to dye loads of fabric for the one and only shop I supply with hand dyed fabrics in Melbourne- Patchworks Unlimited. I guess it is a good kind of business but i really thought I had an extra week up my sleeve. It doesn't help that it has been school holidays these last two weeks- it inevtaibly means less time to do things. The two pieces are for sale. I had to make them for the book Ravissant Lutradur. The piece above is a Stone Angels variation and it measures 10 inches by 14 inches ( 25 cm x 36 cm). It is forsale for $120US. The piece below is a Boabab tree variation- it measures 11 inches by 15 inches and is for sale for $125US. Please email me if you are interested. The time has flown- where has it gone ?? We are still finalising the Carvanserai book- I know it needed to have been done at least a week ago but we had a few tech problems and photo problems- and now I will have to find someone in Melbourne who will digitally print so that at least it can be presented in the folio.We have also been in Melbourne for 4 days as my eldest daughter was doing a folio preparation course, and I wanted to show our French exchange student some of Melbourne's sights. I think many of the sights are over priced and the focus of everything is to shop for rather kitsch tourist goods, which are often just bits of trashy plastic and fake furry animals produced offshore- surely they can do better than this? This travelers' blanket like its predecessor is a form of visual and haptic storytelling. It is of a traveller in search of new cloth and fibres and new inspirations, collecting snippets and scraps for reuse and refabricating into another whole, which is like an aide de memoire, one which can be seen and which can be touched. Little moments of time captured in stitch with leftovers form all kinds of older and other projects , given a different meaning . The cloth has all been hand dyed and printed. I had an order for one of my little dolls for a small cjild- I tried to make him as bright as possible but with the directive that the doll be purple. He looks at home in the village scene! Thank you for all the positive comments for my last post and also the suggestions. I am still dreaming! Anyway I like that they were prepared to do bright for the cover- the orange sings! I am thinking about doing another book- haven't quite decided what- seomone suggested the Travellers' Blanket would be a good one to do int he 72 ways format ( but self pubslihing in colour is too expensive). I am open to suggestions?? ?